Teaching a young person to fish is, in my opinion, making an investment in future. Not only do you impart certain skills that can provide a life time of joy and pleasure, but you also, invariably, cultivate an awareness and (hopefully) respect for our natural environment and some of the other fascinating creatures that share this wonderful planet with us. That is why I consider it prudent to start fishing lessons as young as possible while also keeping in mind that the younger the child the more of a challenge it is. But don’t think it will only be the kid that will be a student; during the process you will realise that there are quite a few things that we, as adults, can learn from kids! 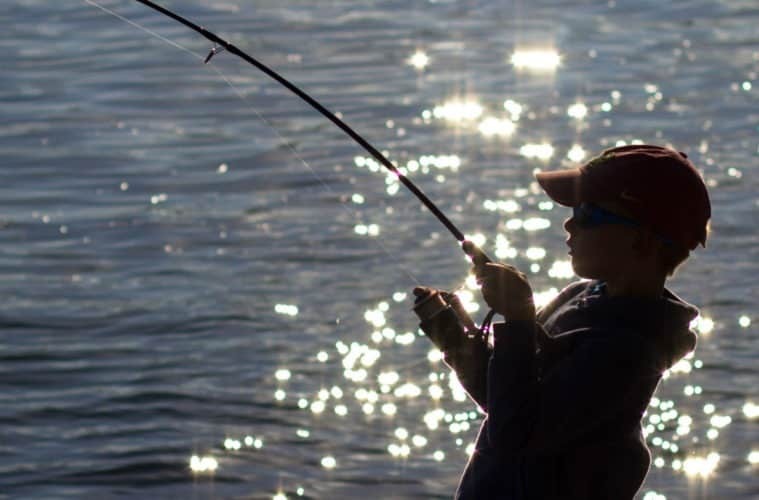 In this article I want to reflect on some of the aspects which I consider to be important if you intend to introduce fishing as a hobby to young kids. but the bulk of the article has little bearing on fishing itself and is mostly concerned with some basic rules to adhere to when dealing with young, energetic and inquisitive creatures, namely small humans. We were fortunate in living close to the ocean during my daughter Rebecca’s formative years and we also had access to a lake stocked with bass and tilapia during summer holidays which gave the two of us ample opportunity to embark on fishing excursions. I introduced her to fishing at the tender age of two years after my dear wife insisted the two of us should spend quality time together during weekends. The first year or two did not consist of much more than the two of us going to the beach, peering into rock pools at low tide, catching crabs and rockfish with a little scoop net and playing football games amongst the sand dunes. However, by the age of four Rebecca started to show an increased interest in the fishing itself and eventually turned into quite an accomplished young angler by the time she was seven. Firstly, let’s look at easy, safe and accessible places to take the young ones to go fishing. A suitable place to start with would be freshwater ponds which more often than not accommodate a wide variety of fish species including bass, blue gills, tilapia and catfish. You can find ponds on golf courses and farms, established by farmers as water reservoirs for livestock, irrigation purposes or to prevent soil erosion in certain parts of a farm. Some ponds came into existence purely for aesthetic reasons though being part of urban planning by city councils and forming part of parks, “green belts” or other recreational areas. Ponds can differ in both shapes and appearances, but they do share certain common features, in my opinion. They are neither very big nor very deep, but I am definitely nog going to set any specific depth parameters! Suffice to say that they can be anything between one and three meters deep. If you live close to the ocean estuaries, jetties and accessible rocky outcrops all provide ample opportunity to cast a line in relative safety. While mentioning it I may as well stress the point that all fishing should obviously be done with the child’s safety as the primary concern. Do not venture where that safety is compromised; for example poor weather conditions, strong currents, dangerous high tides etc. Always keep an eye out for the kids when fishing, especially on jetties which bring them in close proximity of deep water. When teaching beginners one definitely should go short and light. For spinning and conventional fishing a rod of maximum 2 meters is more than enough and a fixed spool reel to balance said rod loaded with 4 kg monofilament will adequately complete your set. When we are talking small ponds, the first accessory that comes to mind is obviously a float (or bobber). Now, floats come in a wide variety of shapes and sizes and, like most other simple items in life, when choosing them it is not always about practicalities but personal preference. Having said that, I must admit that I am quite partial to the Dutch float because of its lightness and sensitivity. With a float and hooks in small sizes a variety of species, both in freshwater and the briny, can be caught. Because of the danger of a sharp hook being accidentally embedded in a body part (which will definitely ruin any fishing trip) it may also be a good idea to file down all the barbs on your hooks which makes it so much easier to extract from human flesh! As for bait, insects like crickets, earthworms or maggots are more than able to do the trick. However, you’d be surprised how many different fish species will take a simple piece of fresh, white bread if it’s on offer. Some salt water species like mullet can go on a veritable feeding frenzy if one establishes a successful chum line with pieces of white bread. As an added bonus it can provide a handy snack and Rebecca used to nibble on the bread herself when she got peckish while the fishing action was a bit slow. When there are predatory fish (like bass and bluegills) around, small spinners are a great way of hunting for them. Not only is it a very active form of fishing, it also greatly increases junior’s casting skills due to constant repetition. As I have mentioned earlier, the major part of this article is how to deal with kids on a fishing trip designed as a tutorial. Let’s now look at some of these aspects. Everybody who has ever been involved with tutoring small kids will immediately highlight patience as the number one virtue one has to possess. As much as I love fishing, it is probably one of the past times that can test your levels of patience to its absolute limits. Unfortunately patience is something that most of us are sorely lacking, hence one has to make a conscious effort to observe, relax and go with the general flow of proceedings. Enthusiasm is a vital component for any kind of teaching, whether it’s formal, non-formal or informal. It is very difficult, if not impossible, to convey a message in a convincing manner without being enthusiastic about it. And kids thrive on that. Even the most mundane task (eg. cleaning and packing up after a fishing session) should be tackled in an enthusiastic manner. If the fishing outing was not particularly successful in terms of total number of fish caught, create an expectation for the next outing by emphasising the fact that every fishing trip is different from the previous one. After a few outings the young ones will come to accept one of life’s basic truths; Lady Luck sometimes smiles and other times she seems totally disinterested. When embarking on a fishing tutorial I find it best to abandon all ideas of having a successful fishing outing myself. Especially during the early stages of introducing your young student to all the different aspects of fishing you should be focussed mainly on the endeavours of your protégé and at all times be aware of what he/she is up to and what their specific needs are. Be perceptive to your student’s needs and anticipate the things that they need to know, but are not able to enquire about due to a lack of knowledge. Ask questions like: “Do you think there is still some bait on your hook? Maybe you should reel in so we can have a look”. This can prove to be a difficult one, because the memories of our youth are (for some of us!) obscured by the mists of time and the inevitable cynism spawned by years of dealing with life’s harsh realities. But do keep in mind that young kids mostly learn by play. They are curious by nature and tend to ask the most bizarre questions not even remotely relevant to the subject at hand. Be prepared to explain things in a way they can easily understand without going into too much detail. Do not over complicate things; that will definitely result in a loss of interest. The first time I introduced Rebecca to the technique of hunting mud prawns in the intertidal zone she was enthralled. It occurred at the start of one particular fishing trip when we needed fresh prawn for bait. It was during low tide and I showed her how to follow the prawns’ winding burrows in the sand by quickly removing pebbles and rocks until you eventually caught up with the fleeing prawn and the little blighter was exposed. Rebecca was totally caught up in the excitement of the hunt and for her that was definitely the highlight of that specific fishing trip. Eventually when the tide came in I had to beg her to give up hunting crustaceans in order for us to start fishing. Long after that incident, and whenever she had the opportunity to go to the beach during low tide (especially on picnic outings with her friends), she proudly showed off that particular skill. Any activity involving kids of a young age must be kept to the bare minimum as far as time is concerned and fishing is no exception. It may turn out to be a fantastic day with the fish more than obliging and the action hectic and exhilarating, but more often than not it is just the opposite. Be prepared for such an eventuality and plan beforehand what other alternatives there are to pursue if your student starts losing interest in the whole angling business. Don’t force them to stay put no matter what; that is a virtue they will hopefully acquire over time and as their knowledge and skills increase. Once the interest starts dwindling pack up and move onto another activity. It may be a good idea to ask what else interest them regarding your surroundings (eg. beach, pond or river) and give an impromptu nature lesson while you are there. The requests may vary from hunting butterflies to picking up sea shells. In my case Rebecca normally wanted to go for a swim and that’s the way we ended most fishing lessons. Taking your kid fishing is one of the best ways to spend time with each other, developing a strong bond early on and learning about the natural things surrounding us in a healthy and exciting way. Away from other children or grown-ups they will also share things with you they wouldn’t share in a group. I have observed quiet or shy children slowly emerging out of their shell and, as their angling skills improved, so did their confidence also. It also teaches them patience and an acute awareness for their surroundings. It teaches them to respect the creatures of nature as well as the forces of nature. For Rebecca the ability to tie her own knots, put on bait herself and land her own catch unassisted represented a freedom which propelled her to trying more and more things on her own in years to come. Also, guard against being too pedantic or strict. Kids, mostly, want to have fun. I have quite a few friends who, as adults, can’t stand fishing because of the strict regimes they had to adhere to when fishing as kids with their dads. Bait collecting and kit cleaning became chores which left them eventually with little love for fishing due to negative childhood memories. I can honestly say that I’ve spent some of the happiest times with my daughter on fishing trips together. I guess I could’ve done a multitude of other more constructive things during those periods, but I have absolutely no regrets in this regard. Those were truly precious times.